Hello friends and countrymen! I’ve been watching and becoming obsessed with Downton Abbey lately so I’m even more keen to write formally these days. My apologies for my small absence away from the blog. Life has been nutso since the calendar turned to 2012. I’m hoping to be able to set aside more time for blogging very soon. I just gotta get taxes and other Adult Responsibilities taken care of in the meantime. Today, I am sharing with you my homemade hot chocolate recipe. It’s something I’ve tweaked over the years and it’s one of those recipes that can be tailored to just about anyone’s taste, be it more or less chocolate, more or less sweet, more or less creamy–you get the idea. In college, I made this a lot since it’s relatively easy and when we were feeling a little risqué, we would turn it into Adult Hot Chocolate, which is just adding Bailey’s, Kahlua, or even whiskey, if that is your desire. I will preface my hot chocolate story by saying that this cocoa will not resemble anything remotely close to the likes of Swiss Miss or anything “instant,” nor does this recipe use a microwave. If that is your idea of what cocoa is supposed to taste like, you’re in for a shock and a treat. This stuff means srs bsns. 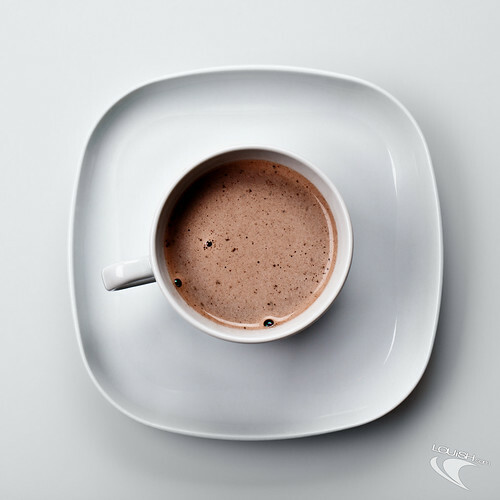 Hot chocolate is meant to be made with unsweetened cocoa, milk and/or cream, and your choice of sugar/sweetener. And that is IT. Really! I can’t tell you how many times I go into a restaurant or even coffee shop to find that nobody does it like this – it’s all instant or made with syrups. This is high fructose corn syrup free, people. 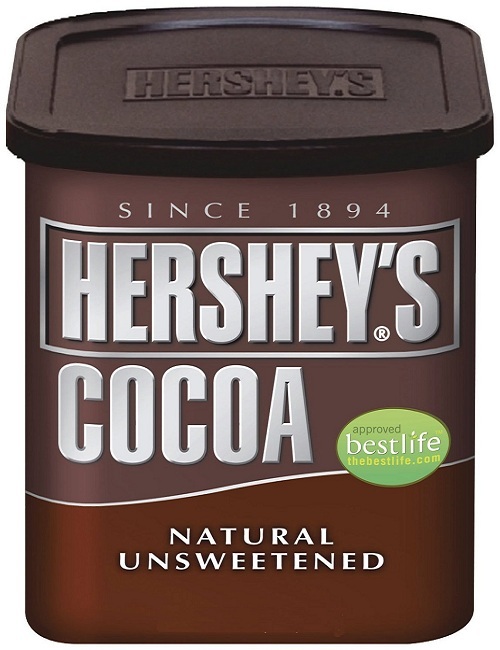 Get yourself some unsweetened cocoa. I used Hershey’s but Nestle and Ghiardelli are also fantastic. For a single serving, you’ll want to put 2 T. of cocoa powder in a sauce pan. If you’re a cocoa junkie like me, use 3 T. I like mine very rich and chocolatey. For two servings, use 4-5 T. of cocoa powder. For each tablespoon of cocoa powder you put in the pot, put in 1 T. of water. Now for the sweet stuff. For a single serving, add 2-3 T. of sugar or Splenda. If you like your cocoa REALLY sweet, you can add more. For two servings of hot chocolate, put in 4-6 T. of sugar or sweetener. I would start off with the lesser amount and add more to taste later. You can’t unsweeten it! Turn your burner on medium or medium/low. This is very important. You can easily burn the chocolate mixture or scald the milk if you have the heat on too high. Using a wooden or metal spoon, begin stirring the ingredients together. If it seems too dry or thick, add another tablespoon or so of water. The mixture should melt together into creamy, melted chocolate. The key here is to stir constantly. The chocolate can burn easily or stick to the bottom of the pot. But since you have your heat on medium to medium low, you’ll be just fine. When the chocolate is clearly melted and getting very hot, time to grab your cream/milk! Because I like my hot chocolate thick and creamy, I use 1/2 C. of cream or half ‘n half and another 1/4 to 1/2 C. milk. You can certainly use 100% milk. If you’re using skim milk, I don’t quite see the point since you may as well be using water, but to each his own. A full cup of 2% milk does quite nicely. For two servings, you may only want to use 1.5 C of cream/milk, but if you want it thinner, use 2 C. of milk. If you use the cream/milk method, add the cream first, stirring constantly and making sure the chocolate blends in nicely. When that becomes dark and chocolatey, slowly add the milk. Keep up that stirring! If you use all milk, pour it in slowly, no more than half a cup at one time, stirring and stirring away. After all the milk/cream has been incorporated and it’s heating up, do a quick taste test. If it’s too bitter, add a a little more sugar or sweetener. If you like it slightly bittersweet, as I do, get it to a nice hot temperature and pour it into your favorite mug. Optional toppings are marshmallows or whipped cream. If you make your cocoa slightly bittersweet, marshmallows are such a nice option because you’ll get a little burst of sweetness melting in your mouth with the creamy cocoa. But sometimes a naked cup of hot chocolatey goodness really does the trick. I’d love to hear if you try this out and if you love it as much as I do! This is definitely filed under Zoe Recommends: Homemade Hot Chocolate! Bon appetit! Photo courtesy of Louish Pixel on Flickr. I haven’t had this in FOREVER. Mmmm. Well I’ll have to make some again, huh? Zoe, your comment about skim milk slays me! I would agree, except if one uses organic skim, which is creamier. i think 1% (organic!) is about my limit. Also, another seriously chocolatey cocoa is Droste Dutch cocoa. VERY good! Agreed! I know Dutch processed cocoa is even more chocolatey, I just haven’t gotten my hands on any! Yum to the extreme! This sounds 100% tastier than the water I’m drinking! This how I make my hit chocolate except I’m dairy free so I use almond milk and I sweeten it with honey. So good and creamy! Janna, that sounds great, actually. I have heard almond milk is delicious. Perhaps I’ll try it sometime for a nice change-up!